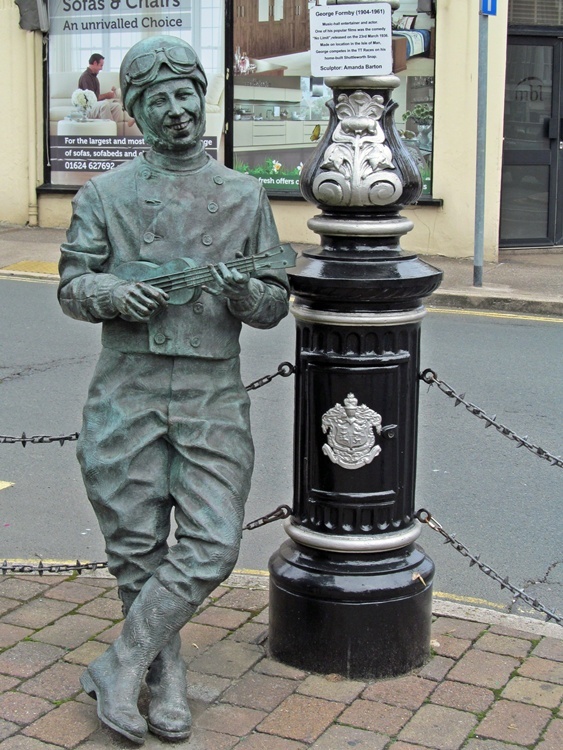 Part of a national group formed in 1961 after his death, members celebrate the life, music and film career of Wigan's most famous son and 'Ukulele Man' - George Formby. These regular social gatherings are for players and those who enjoy the music of 'The Cheeky Chappy'. 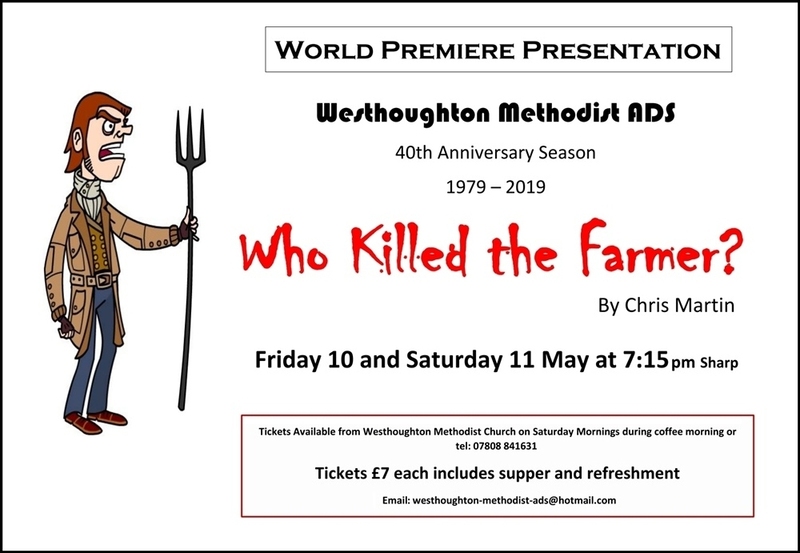 The Westhoughton branch meetings commence with a 'thrash', where members play their ukuleles together, then individuals and sometimes duos in turns play some of George Formby's most famous and not-so-famous songs; occasionally songs other than those by George Formby are performed. The group will break for a short interval, and then the programme continues until about 10:30pm, ending with another 'thrash'. It is fun and social, and a way of getting into the ukulele or banjo and getting tips or learning new songs. The players regularly meet and practice a programme of songs, which are then played at various gigs and events - such as the W.A.C.O. It's-a-Knockout events and the 2016 Westhoughton Yarn Bombing Festival. 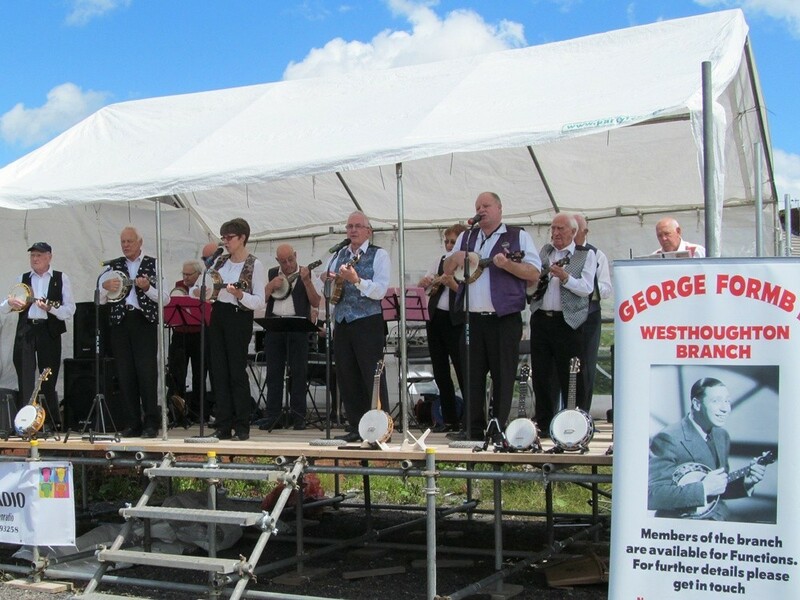 The local branch is part of the National George Formby Society, and many members attend the conventions which are held at the Imperial Hotel, Blackpool four times a year (in March, June, September and November). 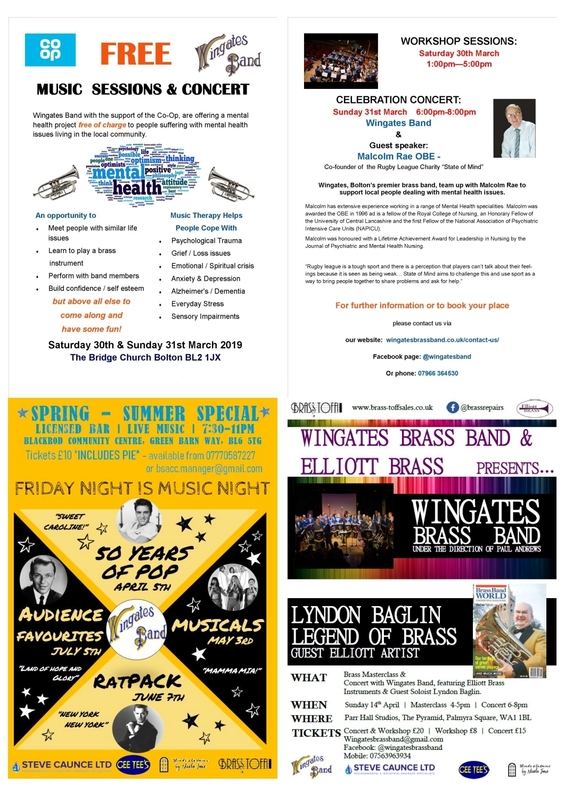 These popular events have attracted some famous names over the years, fans of George Formby such as George Harrison, Eric Clapton and more recently Frank Skinner. By Royal Appointment: In April 2018, the group was honoured when members of the Westhoughton branch were amongst the players at Her Majesty The Queen's 92nd Birthday Party, performing on stage at the Royal Albert Hall an ensemble rendition of 'When I'm Cleaning Windows' led by Frank Skinner, who had recorded an introduction piece at a recent Blackpool conference and gathering. The Queen was a big George Formby fan as a girl, and it was fitting to see the Ukulele Man celebrated at this event. A great moment for this local group. 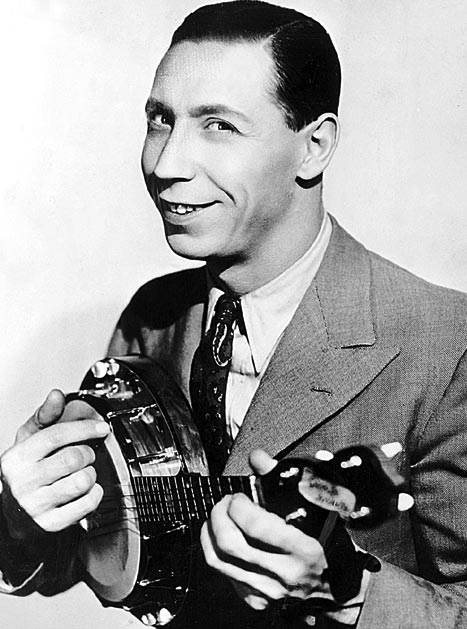 Born George Hoy Booth, George Formby achieved fame as a singer-songwriter and performer of cheeky often saucy songs, a comedian and star of many films during the 1930s and 1940s featuring the put-upon George who would win in the end, and could charm us all with his ukulele repertoire. Following in the footsteps of his father, George took to the Music Hall stage, later transforming his act when he began to play his trademark ukulele, becoming the UK's highest-paid entertainer. He captured the national mood as a cheeky northern chappie, lifting spirits in tough times, and especially so during World War II when he was a troop entertainer. His style would influence actors such as Charlie Drake and Norman Wisdom; and his Music Hall legacy would permeate later music - the Beatles were among his fans. George died in 1961 (aged 56); his music and sense of fun live on with fans around the world, happy to pick up a ukulele and perform his songs. The ukulele is often the first stringed instrument children learn at school. Since his death George Formby has been the subject of five biographies, two television specials and two works of public sculpture. More (Wiki). All are welcome to join this friendly musical group, whether playing or learning to play ukulele, or to simply enjoy the music. The group are happy to hear from the local community, and are happy to perform at events and parties. Dennis Lee (Concert Organiser) - 01942 386709 | email.